The London Olympics are almost upon us and having completed our series on the Queen to mark her Diamond Jubilee, we’re launching a new special looking at historic sporting events which took place in London and where they were carried out. To kick it off, however, we thought we’d take a look at Olympics past. London has previously hosted the Games twice – 1908 and 1948. So this week we’re taking a look at the 1908 Games. The 1908 Summer Olympics – officially recognised as the fourth “modern” Games – were initially to be held in Rome. But the eruption of Mt Vesuvius in 1906 devastated the city of Naples and so the funds which were to be used for the Games had to be diverted to help the stricken community. A number of candidates, including Milan and Berlin, were apparently considered before it was decided to hold the Games in White City in London’s west alongside the Franco-British Exhibition already being held in the area (the white marble clad buildings constructed for the exhibition buildings are what gave the area its name). A new stadium – the White City Stadium – was constructed in just 10 months for the Games and was designed to accommodate 66,000 people. As well as the running track around the perimeter with which we are familiar today, there was also a cycle track located outside the running track while the infield hosted swimming and diving pools and a pitch where football, hockey, rugby and lacrosse could be played. Wrestling and gymnastics was also conducted in the middle of the stadium. While many of the 110 events in 22 different sports – including athletics, archery, lacrosse, rugby union, swimming, water polo and tug of war (the only time run at an Olympics, it was won by a City of London police team) – and were held at the stadium, a number were held elsewhere. These included tennis (at the All England Lawn Tennis and Croquet Club in Wimbledon – see yesterday’s post), rowing (at Henley), fencing (at the neighbouring British-Franco Exhibition) and jeu de paume or ‘real tennis’ (at the Queen’s Club in West Kensington). The Games, which ran for six months from April to October, were noted for being the first in which Winter events were included (four figure skating events were held at the Prince’s Skating Club in Knightsbridge), for being the first at which the Olympic creed – “The important thing in life is not the triumph, but the fight; the essential thing is not to have won, but to have fought well” – was publicly proclaimed. They were also the Olympics at which length of the marathon was set at 26 miles, 385 yards (the distance from a window outside the nursery at Windsor Castle, where the event was started to give the Royal Family a good view, to the stadium) and were the first Games in which spectators marching into the arena behind their country’s flag during the opening ceremony. The marathon, incidentally, was particularly controversial with Italian Dorando Pietri finishing first after being assisted across the finish line by officials when he collapsed (he was disqualified but awarded a special cup for his efforts by Queen Alexandra). There was also controversy when the US team refused to dip their flag before King Edward VII in the opening ceremony. Judging disputes also led to the creation of standard rules and the introduction of neutral judges in subsequent Games. 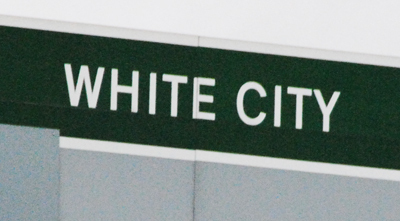 White City Stadium initially fell into disuse but was subsequently used for greyhound racing and athletics. The site is now occupied by the BBC. There is a ‘Roll of Honour’, unveiled on the site in 2005, which commemorates the 1908 Games. Oh, and the most medals were won by Great Britain who won 56 gold, 51 silver and 38 bronze while the US came next with 23 gold, 12 silver and 12 bronze. You can check out the Olympic website for more including images – www.olympic.org/london-1908-summer-olympics. I think it was a brilliant idea to stage the Games alongside the Franco-British Exhibition already being held in the London area. This nearly doubled the potential number of visitors to the Games and nearly halved the costs of infrastructure eg public transport. If only planners were as clever now.